This post is sponsored by College Inn®. The thoughts and opinions are all mine. 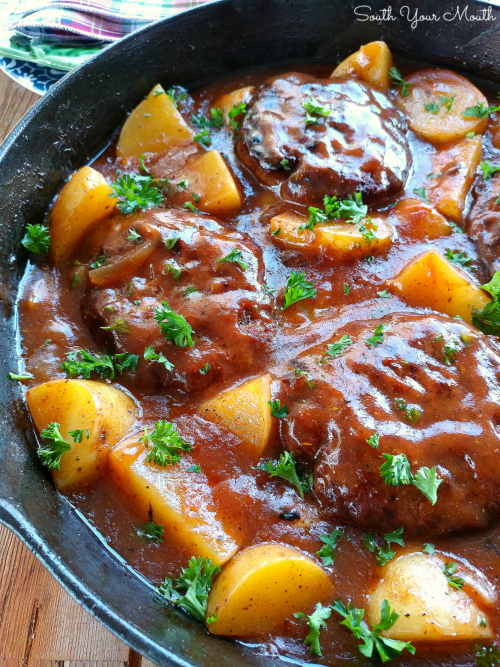 Salisbury Steak only ever meant two things to me: 1) that processed lump of meat swimming in glumpy gravy in the school cafeteria and 2) something that came in a TV dinner. It was not something I grew up eating or cooking. Or maybe it was. I think for folks around here, ‘Salisbury Steak’ is a very close cousin to what we would simply call ‘Hamburger Steaks & Gravy’. One thing I have learned with this blog is that, depending where people are from, we call the same things by different names. When I first started cooking for my family, I leaned on the internet a lot for recipes I didn’t have in my family recipe arsenal. 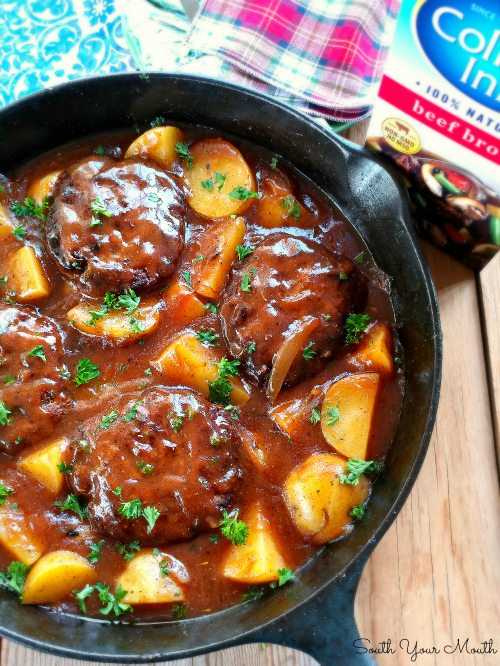 One day I came across an article from Alton Brown (which of course I can’t find now) about Salisbury Steak. The article caught my eye because I remember thinking What even IS Salisbury Steak anyway?? According to Alton and a lot of other reading I did that day, traditional Salisbury Steak gravy has some sort of tomato element to it (this could be actual tomato wedges, a bit of tomato paste, a little ketchup, etc.) 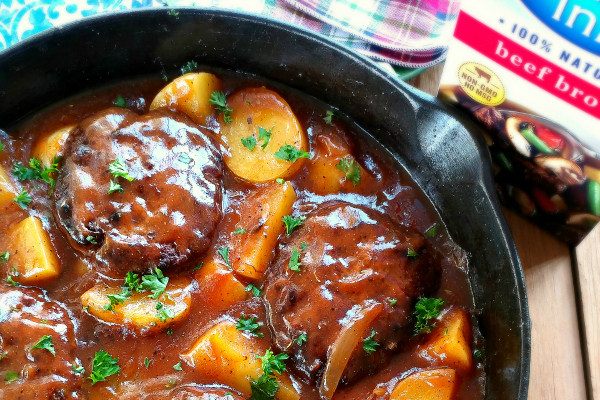 and not just the plain pan gravy I’d make with my regular ‘Hamburger Steaks & Gravy’. AH-HA! Now I knew the difference! It can also be made from cubed steak or other cuts of beef but that’s a whole other discussion for another day! So, when I decided to make this recipe, I added in a bit of ketchup to the gravy. I also added a little Worcestershire too because that seems to be a common element in traditional Salisbury Steak gravy. And I LOVED the way it turned out! That little bit of acid really cuts through the richness of the dish and brightens everything up. And of course, I used College Inn® Beef Broth because it really is a better broth. 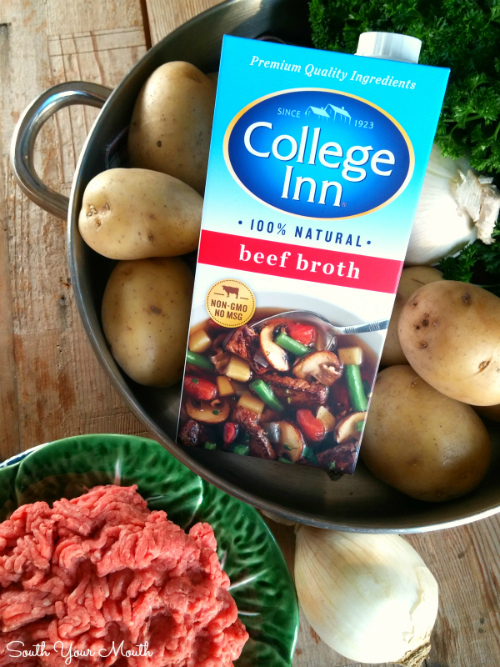 College Inn crafts a deeper, richer broth by using all-natural beef and farm-grown vegetables. They combine these with flavorful herbs and spices and then finish with a long, slow simmer. Seriously, the savory taste of College Inn broth is the detail that makes meals like this delicious. I made this recipe to be a one-pan meal wherein the potatoes cook right along with everything else because I’m always looking for quick weeknight supper ideas for my family. If you’d rather have traditional mashed potatoes with yours, just scoop the potatoes out before you make the gravy and prepare them as you normally would for mashed potatoes or just leave them out and cook them separately. Don’t look at this and think the ingredient list is too long or that the recipe it too complicated. Many of the ingredients are repeated in each step. I just broke the recipe out into separate steps to make things easier to follow along. Boom. And the best part? It is insanely delicious! Combine ground beef, spices and worcestershire sauce and mix together with your hands. Shape mixture into 4 separate patties about 1/2-inch in thickness. Add just enough vegetable oil to a large skillet to cover the bottom then heat over medium/medium-high heat. Cook patties on each side until cooked through then remove from pan. Do not drain pan drippings. Pierce each potato a few times with a sharp knife then place on a microwave-safe plate. Microwave potatoes for 5 minutes. Meanwhile, add onions to the hot skillet, season with salt and pepper, then sauté until tender. Remove potatoes from microwave then cut each into 4-6 pieces (you want them to be about an inch and a half in size). Add potatoes and 2 cups of broth to onions. Once the broth starts to boil, cook until potatoes are completely tender (about 5 minutes). Combine gravy ingredients and mix well. Pour into the skillet with the broth and potatoes then stir until gravy thickens. Reduce heat to low, add steaks to skillet then cook for a few minutes to ensure the steaks are nice and hot. You can skip the microwave step and cook the potatoes in the broth if you’d prefer. If you do, make sure to cover the skillet while they’re cooking. I added the microwave step in there to cut the cook time for the dish. Add more broth if necessary if the gravy is thicker than you like. One thing I’ve noticed over the years is that all cornstarch is not created equal. You’ll have a spare cup or so of broth to work with because the carton of Country Inn broth has 32 ounces. Perfect! Use however many potatoes you need for four servings. With the size potatoes I used, 2 each was perfect. I didn’t peel my potatoes but you’re welcome to peel yours if you prefer (if you do, cover them before microwaving). Just made this it is perfect comfort food. Really enjoyed it thanks for the recipe. 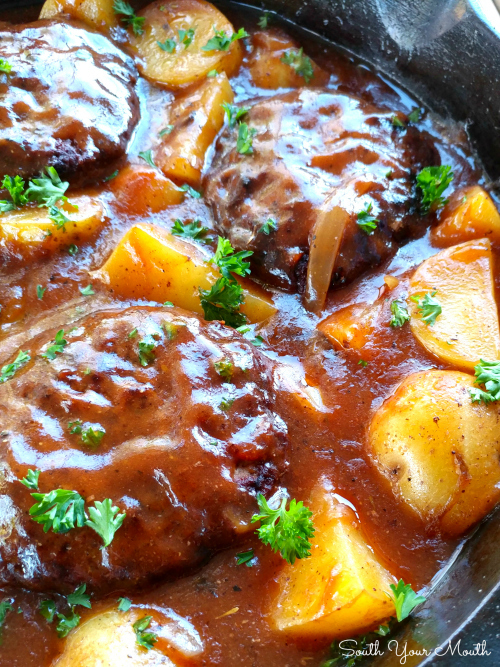 I made this for supper last night and the taste was pretty good,especially the gravy. I was slightly disappointed at how dry the "steaks" turned out. Even the next day, after sittung in the gravy overnight, still dry. I think next time I will play with a way to make them more moist before cooking them. Otherwise,quite tasty. YUM!! Sauteed some mushrooms before I put the onions in and it was a hit! Made enough for leftovers but there weren't any!!! Which brand of cornstarch do you use?